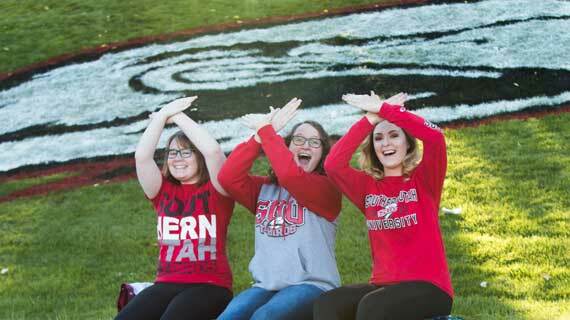 Southern Utah University’s Homecoming Week is not only a time to welcome back former students, but for the campus and community to celebrate SUU. A full week of activities will honor SUU and its students this year starting on Sunday, October 7 and ending with the football game and Headphone Dance Saturday, October 13. All students, past and present, faculty, staff, parents of Thunderbirds, descendants of founding families, friends of the University, and community members are invited to share in the rich heritage of SUU. 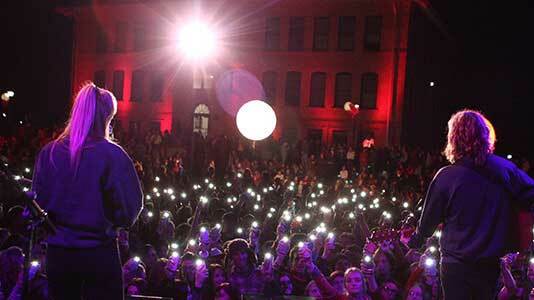 Homecoming week brings together the Cedar City community for a multitude of festivities, all found below. The week begins with the women’s soccer team battling Portland State at 1 p.m. at the Soccer Field. The annual Miss SUU Pageant gives the ladies of SUU a chance to compete in a variety of events to determine who is the next Miss SUU. Baylee Terrones, the reigning Miss SUU, will pass her crown off to the woman who wows the judges and crowd in the SUU Auditorium at 7 p.m.
Watch the women’s volleyball team plays Northern Arizona University in the America First Event Center at 6:30 p.m. 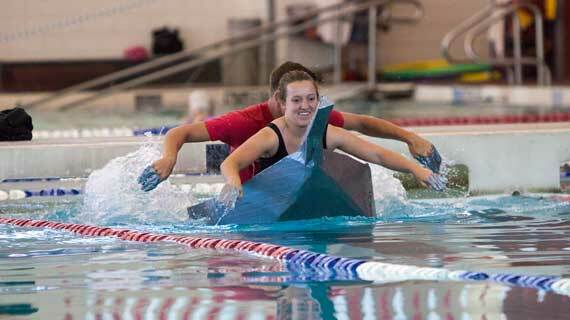 The week rolls on with the Cardboard Boat Race at the SUU pool. All SUU students, faculty, staff and alumni are welcome to build a boat and race or come and watch the fun. Professor Richard Cozzens will be holding cardboard boat building workshops for anyone who would like help building a boat. Join the workshops Tuesday, October 2 and Thursday October 4, from 6-8 p.m. and Saturday, October 6, from 10 am. to noon. All three workshops will be held in the Technology Building Room 106. That evening, there will also be a senatorial debate between Mitt Romney and Jenny Wilson, held in the America First Event Center. Due to high demand, tickets are no longer available, visit the Utah Debate Commission website to submit a question and learn more. The debate will be televised on CNN, C-SPAN and Fox News. The Student Programming Board will host two Dive-In Movies at the pool in the SUU PE Building. Families are invited to watch Christopher Robin from 5-7 p.m. and students are invited to Ant-Man and the Wasp from 7:30-10 p.m.
Join the A.P.E.X Event series as they celebrate the achievements of SUU’s finest alumni with a special alumni speaker, Mvemba Phezo Dizolele, at 11:30 a.m. in the Whiting Room of the Hunter Conference Center. Dizolele is a respected foreign policy analyst on African affairs, an educator at Johns Hopkins School of Advanced International Studies, and author of the forthcoming biography, Mobutu: The Rise and Fall of the Leopard King. Alumni and friends are invited to attend the Annual Homecoming Banquet to celebrate our alma mater and recognize three individuals: Mvemba Dizolele (Outstanding Alumnus), Kathryn Berg (Distinguished Service), and Rhett Guter (Young Alumnus). The banquet will be held in the Gilbert Great Hall from 6:30-8:30 p.m. To reserve tickets, please call the Alumni and Community Relations Office at 435-586-7777. The night festivities kick off with the annual Powder Puff Football game. The game features 25 Lady T-Birds and is a great opportunity for friends and family to enjoy more football action at 7 p.m. in the Eccles Coliseum. Following the Powder Puff Football Game, the Pep Rally in the Eccles Coliseum will ensue at 8 p.m. Sure to be energetic, the Pep Rally gives students an opportunity to get riled up for the football game on Saturday. Leading out the weekend, Parent & Family Weekend is held in conjunction with Homecoming Weekend and is hosted by SUU's Parent and Family Services. Parents and families are invited to return to campus and enjoy Homecoming with their student. Check in will begin at 5 p.m. in the Sharwan Smith Student Center. Heading into the night, there will be a SUUSA EC Reunion at 6 p.m. in the Hunter Conference Center and a Nursing Alumni Dinner at 5 p.m. on the Science Center South Lawn. The night is headlined by the annual Forever Red beginning at 7:30 p.m. on the Upper Quad with free food for everyone in attendance. One of the most anticipated events of the week -- and the entire year -- Forever Red offers the perfect opportunity for alumni, students and community members to gather on the Upper Quad with lively music, fireworks, and more food than could possibly be eaten in one night. Featuring Abba Mania, the night promises to delight audiences of all ages with favorites like 'Mamma Mia, 'Dancing Queen', 'Winner Takes It All', 'Super Trouper' and many more. The day begins with the free Pancake Breakfast served at the Alumni House starting at 9 a.m., sponsored by the Emeriti Association, SUU Alumni and the Student Alumni Board. Then the annual Homecoming Parade, with the theme “Pushing Limits,” will come trekking along at 10 a.m. down University Boulevard with floats produced by student organizations and local businesses. Take a tour of SUU's new business building while catching up with professors and staff of the Dixie Leavitt School of Business from 12-2 p.m. The All Student Leader Reunion, will be held from noon to 2 p.m. in the Whiting Room of the Hunter Conference Center. This reunion is for all alumni to served in campus organizations and clubs. Cost is $10 (includes lunch and a general admission game ticket). Please RSVP to the Alumni Office at (435) 586-7777 by Monday, October 8, 2018. Join the Southern Utah Museum of Art for a Family Day including family friendly visual and performing arts activities for people of all ages from 2-4 p.m.
And what would Homecoming week be without a football game? Cheer on the team during their traditional Thunder Walk at 3:30 p.m., then head over to the in the Softball Parking Lot for the Tailgate Party. 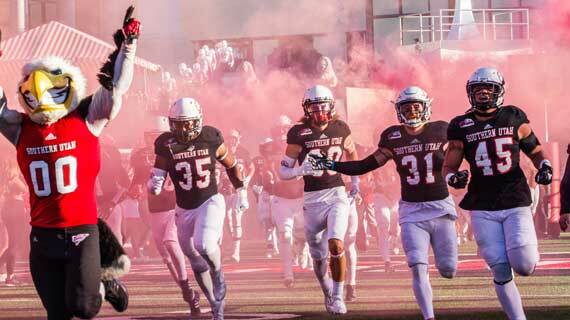 At 6 p.m. the Thunderbirds will take on the Sacramento State Hornets in the homecoming game. This is a Red Out game, so be sure and wear red! Current SUU students receive free admittance with a valid student I.D. All other fans are encouraged to purchase their tickets in advance through the America First Event Center Ticket Office or call 435-586-7872. Visit the SUU Homecoming webpage to learn about individual reunions and other events.